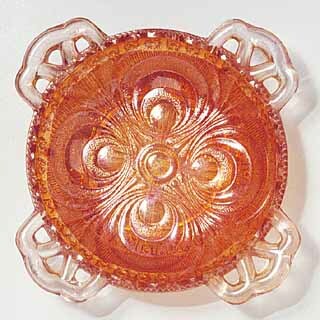 This looks a lot like the Imperial design but it was made by the English glass maker, Sowerby. They also used the design on the interior of their Diving Dolphins bowls and rosebowls. This item is a small sauce or ashtray. Cute and not often found. Typical marigold examples sold in 2005 for $8 and 2013 for $10.